Nephrite is a very tough mineral and was originally used in primitive times to fashion tools such as axes, knives and clubs. The mineral is abundant worldwide, being a metamorphic alteration product of serpentinites. 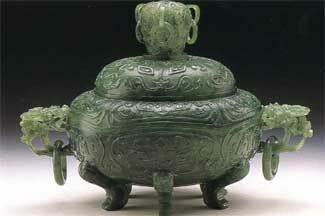 The Chinese have prized the nephrite variety of jade more than any other gemstone. For over 3000 years, they carved flat discs with a central hole, termed pi, from nephrite to worship heaven. Jade was equally important after death, with pieces placed in the deceased's mouth to serve as a heart in the afterlife. Two minerals are both considered to be jade, nephrite and jadeite. The latter was not discovered until the mid 1800s in Burma.